Teaching Without Walls: Life Beyond the Lecture: Classroom 2.0 Workshop...Coming to Sac Soon! 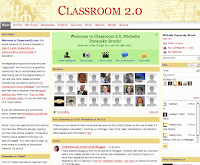 Classroom 2.0 Workshop...Coming to Sac Soon! Recently my colleague, Michelle Macfarlane, and I met with Steve Hargadon, creator of Classroom 2.0, and Jory Hadsell and Melissa Green from Sac City College to discuss the planning of an upcoming Classroom 2.0 workshop in the Sacramento area! Details are brewing and we're all really excited about bringing more of this dialogue to higher ed institutions in our local area. The workshop will be a two-day event sometime this spring (hopefully) and...here's the best part... it's free! Stay tuned or keep your eyes on the Classroom 2.0 workshop page.